Patient Charity Fertility Network has reached 100,000 signatures on the #Scream4IVF petition calling for fair access to NHS fertility treatment and an end to the IVF postcode lottery. Petitions which reach 100,000 signatures prove the public demand for a debate in Parliament. 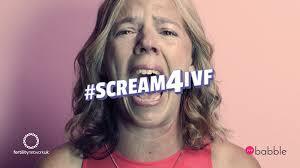 The #Scream4IVF campaign, with partners Saatchi & Saatchi Wellness, was launched less than three months ago on 6 September 2018. Congratulations to all at Fertility Network UK on this huge success, particularly Chief Executive Aileen Feeney and London Regional Organiser Anya Sizer!